This peculiar story was caused indirectly by a wonderful random voyage of exploration the hubs and I took to Utah last summer. Being a featured conference speaker was the perfect reason to get in the car and escape for a couple of weeks, driving is so much more fun than flying any time you can pull it off. 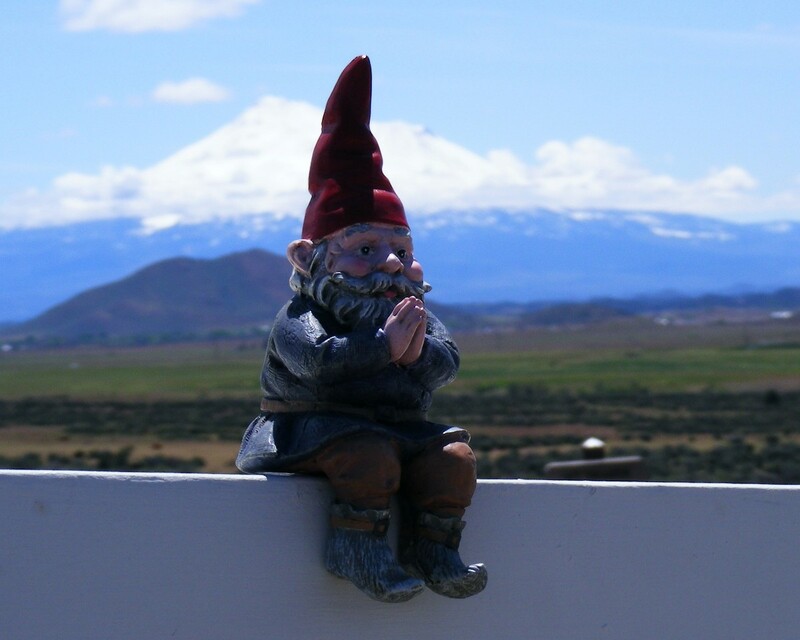 Terry and I loaded up the Mushka, the Portable Shi Tzu, and our suitcases and some camping gear and headed down the spine of Washington state, I-5. We stayed on I-5 all the way to the bottom of Oregon where we stopped to hoist a few beers and hang with Flamingo Pam for a day in Medford, Oregon. 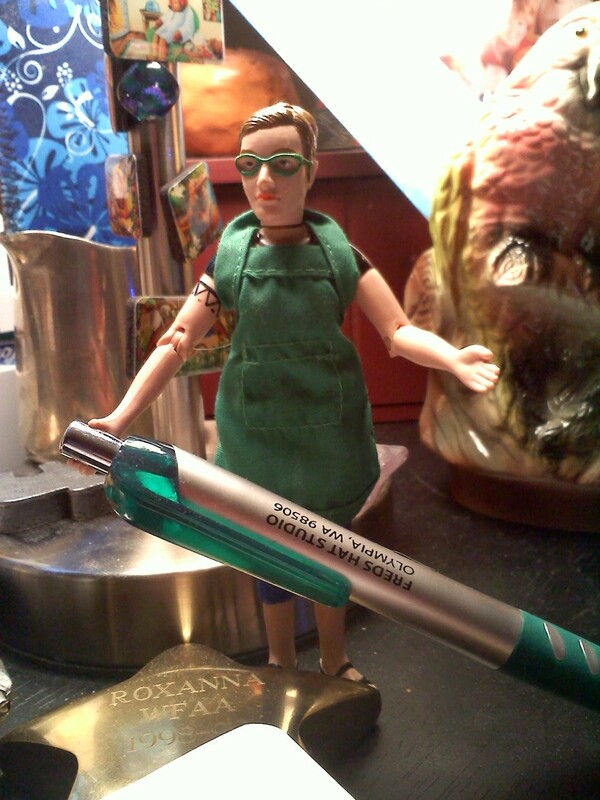 Medford was also the place I realized I had forgotten my muse, my lucky charm, my fellow traveler, Barbie Barista. I couldn’t find where I had stashed Barbie before the trip so the local all purpose we-sell-everything store in Medford was my last hope for an inert yet sparkling traveling companion. A visit to their toy section provided nothing on par with my missing Barbie. Wolverine, Superman and Tinky Wink were just not ringing the bell for me. 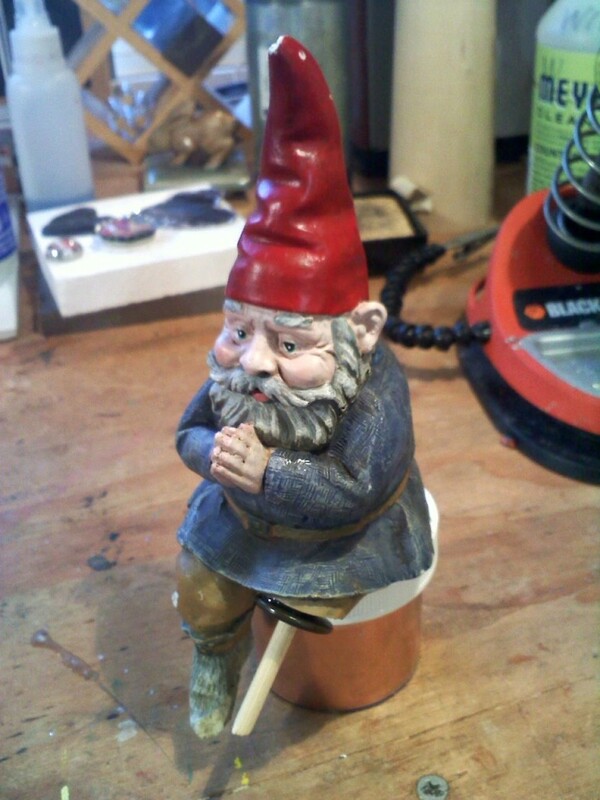 I was ready to put a dress on a wooden spoon and call it a supermodel when I tried the garden shop, and after a short search I found a box of short gnomes languishing on the bottom shelf of the garden tschotske row. Yes, I know the roaming gnome has been snatched up, but I was desperate, so I chose a seated gnome who appeared to be praying. My German style Saint Christopher gnome of the road, pray for me, I can use the help. We hit the road for points east-car, dog, hubs, me and the praying gnome. 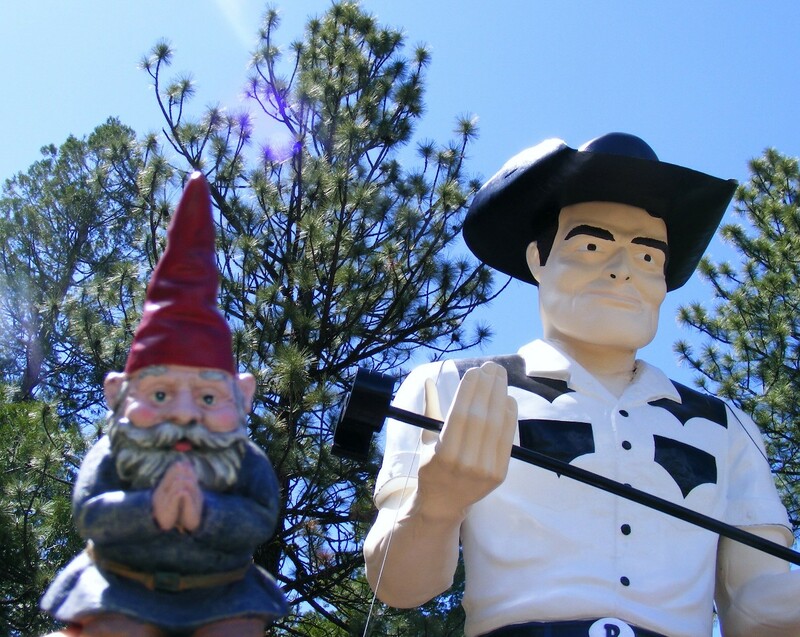 We did fine through northern California, stopping to view Shasta, Mt Rainier’s cousin, take in the wild fire devastation from the Hat Creek Fire of the previous year and then we found this gigantic gaudily painted statue in the middle of freaking nowhere. I mean really, who expects to see a giant lumberjack/tire sales guy/whatever giant figures are used for in the middle of a wide spot in the road. The owners had even built a little shelter with information and a guest book to sign! The complete experience. The gnome had his picture taken with the cowboy and we headed onwards, jumping off to ghost towns and adventures down Highway 50 outside Carson City, Nevada. Highway 50 has the moniker “loneliest road in the USA”, but I think that might have been a few years back. Its pretty empty but the locals drive through there at 300 mph in their pickups, shortcut to where?? We actually saw lots of cars and people on our trek. 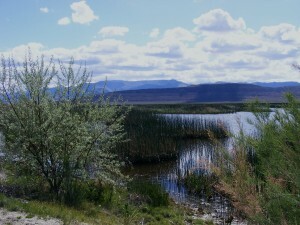 We also saw some very cool things along the way including the Stillwater National Wildlife Refuge near Fallon, Nevada. I could have stayed there for days and just listened to all the birds in the lakes and marshes, we could see very few of them but you could hear them making an enormous racket. Oh for a kayak, but I must remember we were driving a Mini Cooper that was pretty darned loaded as it was. Past Fallon, things got strange. The Black Rock Desert is where Burning Man is held each year and except for those few days annually the place is EMPTY. Alkali and salt flats for miles and miles. Sand Mountain, a singing dune, was wayyyy off in the distance being run over by off road vehicles, seriously. But close to the road, nada. Except for the rocks where there should not be rocks. 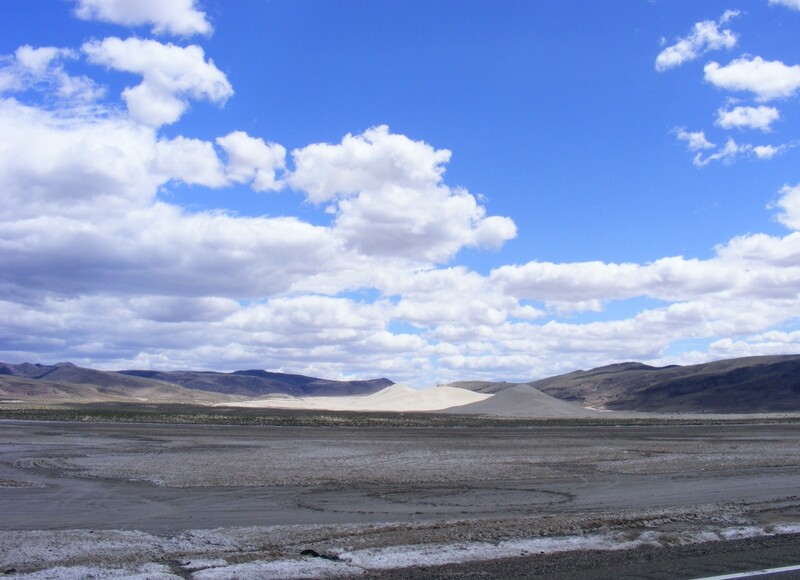 This is a link to a howlingly funny article on the drive through this desert. 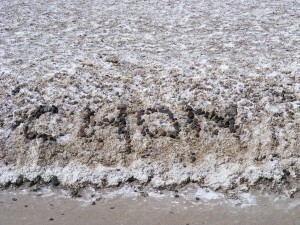 I started seeing messages spelled out on the desert along the highway’s shoulders with black rocks. Brick sized rocks, not boulders. To participate in this sport/event/what ever it is, people have to gather rocks and cart them to the desert in boxes and baskets, park on the side of the road and then lug the rocks out onto the flats to spell out arcane messages, like all the of the “I love (fill in the blank)” and even a “will you marry me?” Lots of names and peculiar sentences, all hard to read without stopping so we stopped to do some light reading. 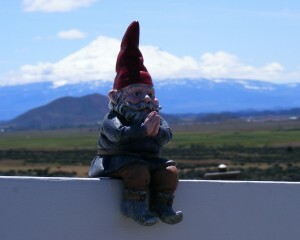 I got Mantis the gnome out, by now he had a name, to pose for a picture. It was chilly and windy so I jumped quickly back in the car and we drove off. Uh oh. Resounding clunk is heard. What the hell was that? Praying Mantis! I went back and found him laying in the road with a few chips out of his hat, intact, except for the missing leg. We never found the leg. I wonder what the people carrying boxes of rocks to spell out messages thought when they came across his little brown booted leg in the road in the middle of nowhere? 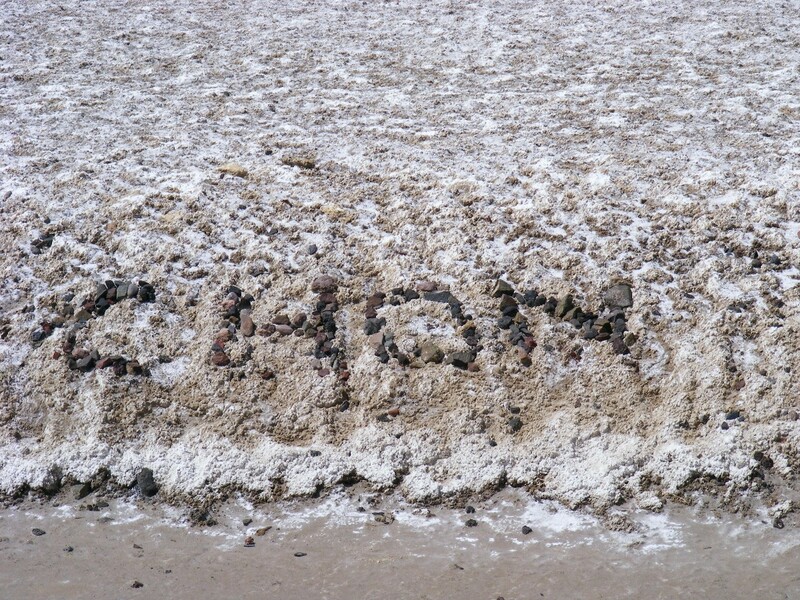 Can you imagine being so hard up for fun on a Saturday night that you drive 50 miles to write a message with rocks on a salt flat in the middle of nowhere? It boggles the mind…. Mantis had surgery last week and came through with flying colors thanks to a barbecue skewer and a button. He now has a nice pegleg leg and I must say, we both look happier. 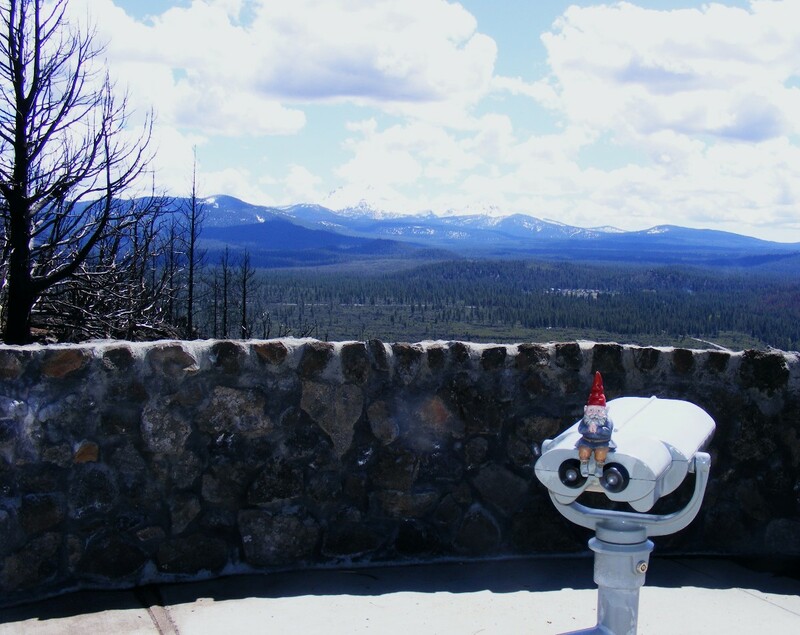 This entry was posted in Life, the Universe and Everything, Travel, Uncategorized and tagged travel on highway 50 on February 11, 2011 by rox.